He made the statement during his first rally for the 2020 campaign. It has been an eventful 24 hours for President Trump. On Monday evening, he held his first 2020 campaign rally in El Paso in Texas, where the crowd continued to show some extreme support for the idea of his second term as president. 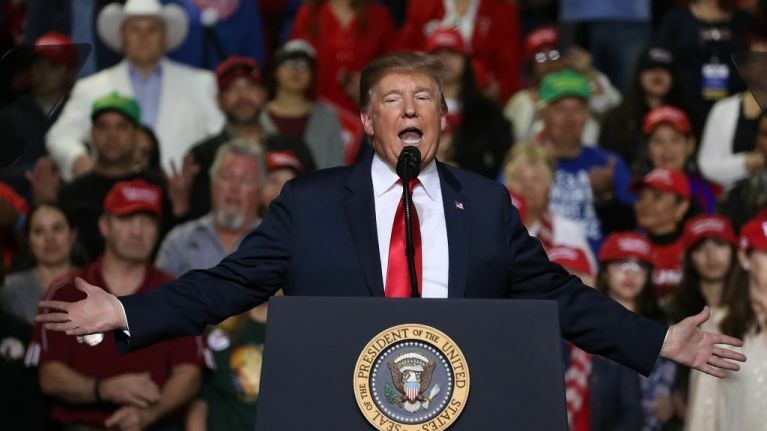 During that first rally, a BBC cameraman was assaulted by members of the crowd, during the segment of Trump's speech when he denounced the media. However, it was during his time talking about Democratic governor Ralph Northam that has garnered the biggest reaction. Northam has come under fire recently for some statements about late-term abortion, and just a few days later, a photo surfaced from the governor's 1984 medical school yearbook which showed one person wearing blackface, and another dressed as a member of the KKK. Northam denied that it was him in the photograph, but did admit that he wore blackface once for a Michael Jackson contest. Trump alluded to all of this during his rally speech: "In Virginia, the governor, he has gotten a little publicity lately. I like him. He keeps us out of the papers. I like him. I’d like to find a few more guys like this one." When referencing Northam's public statement about the controversy, Trump said: "He almost moonwalked. His wife stopped him. 'Darling, darling, it would be inappropriate.' I want to see someone try and imitate Michael Jackson in the moonwalk. Just would not have been a good scene." And finally, when referencing Northam's stance on late-term abortions, Trump said that Northam "stated that he would even allow a newborn baby to come out into the world and wrap the baby and make the baby comfortable, and then talk to the mother, and talk to the father and then execute the baby. Execute the baby. Incredible." In the same day, a deal has been reached between the Democrats and the Republicans to provide partial funding for the border wall. This still needs to be approved by Congress, and signed by the President.